Sriman is a 1-year-old who was born with a damaged liver. His parents got him a surgery and while he got better then, he is sick again. Early this year, he became very sick and that was when his parents found out that his liver is totally decompensated. Only a liver transplant can save Sriman. Sriman's was critically ill right from when he was born. While he seemed like a normal newborn at first, but very soon he became weak and dull. His parents Rajanna and Manjula noticed that he seemed to be excreting whatever he ate. He had a blocked bile duct – that was damaging his liver. “His health problems started soon after his birth. He would feed and then immediately have white colour excretion. When we took him to the doctor he told us that his liver was already damaged and he needed a surgery immediately. So we arranged for that,” says Rajanna. 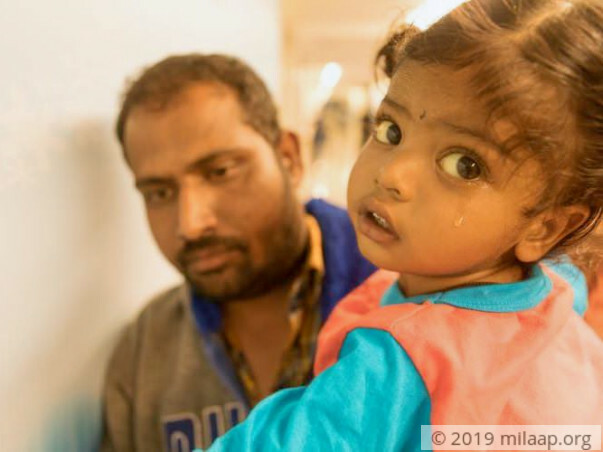 Sriman got his first surgery when he was only three months'old. The surgery helped and it looked like Sriman would finally get better. He managed to retain more food and started to put on some weight. But when early this year, he passed white stools again – his parents took him to the hospital immediately. Being unable to speak, Sriman has not been able to communicate how sick he is to his parents till it was too late. Sriman's liver is completely damaged. Nothing but a liver transplant will help him. His parents know that to keep him alive they have to make sure he gets a new liver. Rajanna works as a helper in a small grocery store in his village in Mancherial, Telangana. His wife stays at home to care for Sriman and their 2-month-old daughter. Rajanna's salary is barely enough to make ends meet and he is already in debt from funding the Sriman's previous surgery. They want to do everything that they can to save Sriman, but no one will lend them any more money. Every day, Sriman's condition becomes a little worse and his parents are keenly aware of having let their child down. Rajanna says he would be glad to give his son his own liver, but he is a diabetic patient and Manjula is a nursing mother. These parents wonder if it would make a difference if they were able to give their baby their own liver. They are in shock and desperate for some help that will allow them to save Sriman. 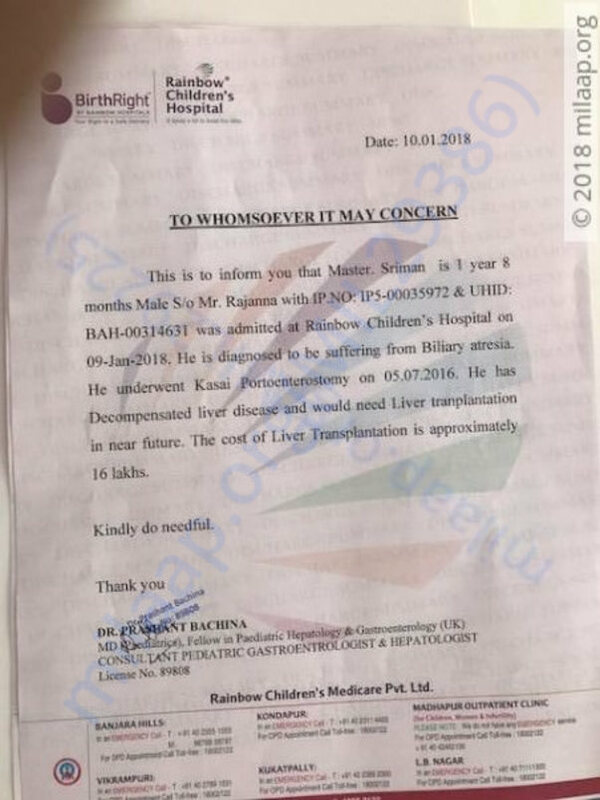 A liver transplant will cost Rs 16 lakhs and it is an amount that Rajanna can never put together in time to save Sriman. Sriman's condition is meanwhile getting worse. Contribute to help these parents save their baby. Thank you for the love and support shown towards Sriman. The transplant has not been done yet, we are still waiting for the doctors to set a date for it. He is currently feeling week. Luckily, he has not been having any other severe side effects at present. Hope you continue to share his campaign with your friends and family! Here is a quick update on Sriman's health. Doctors are trying their best to control the fever as Sriman so that they go ahead with the transplant. The family has to visit the hospital everyday for routine check-ups. Mother could be the prospective donor for the transplant, doctors are conducting tests for the same. Please pray for his health, thank you for the wonderful support. Thank you for the wonderful support that you have shown towards Sriman. He is doing better now compared to earlier. He has not undergone the transplantation procedure yet as he developed a few complications and infections. He has a fever at present and the doctors will be able to suggest the future course of action once his fever subsides. Thank you all once again. Do share this campaign further with your friends and family and help them in raising funds towards his treatment. Will keep you posted.